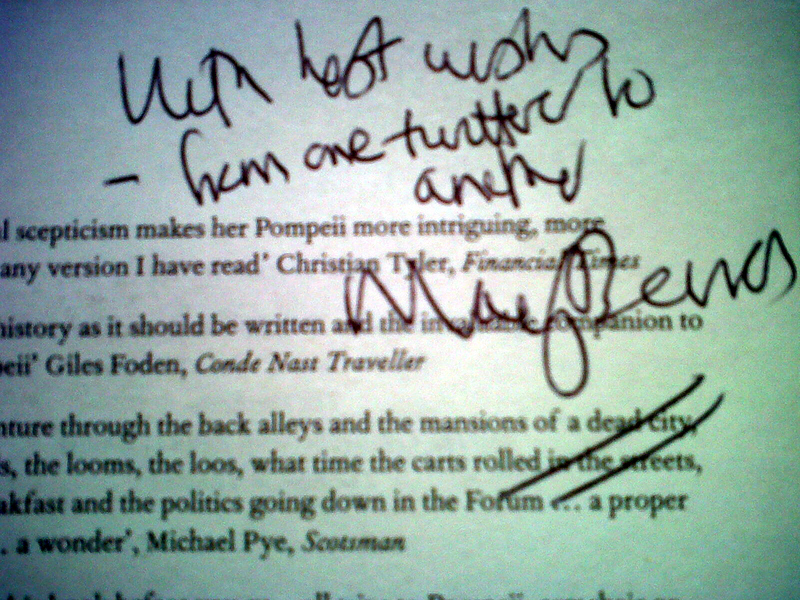 PrefaceI think I originally started work on this paper around 1996. I certainly remember working on it around 2000 to 2001. By that time I felt that the paper was not coming together very well. In part, this was due to my attempt to shoehorn together some rather traditional concepts of gravestone art with my somewhat more unusual (read: crazier) take on a statistical approach to the subject (See Chapple 2000). Part of the reason I abandoned this piece was that while I felt that either approach worked well on their own, the two together did not quite fit. Attendant to that, I began to wonder what the audience would be for something like this – perhaps a bit too technical for a genealogical or art-focused reader, but a bit too pedestrian for a professional archaeological audience. In retrospect, another problem of the piece was its lack of focus. Essentially, I was attempting to pad-out a paper on vocational gravestones with some other memorials that interested me from the same corpus. Either on their own would have been too short to make a robust paper, but together they did not work – at least that was how I felt at the time. I have now slightly reworked the original text and cut it down to just the vocational stones, though I still hope to post Part II on some of the other interesting memorials at some date in the future. Fig. 1. Map of south Galway, showing the location of Killora (A) and Killogilleen (B) graveyards. A Zoomable version of the map is available: here. 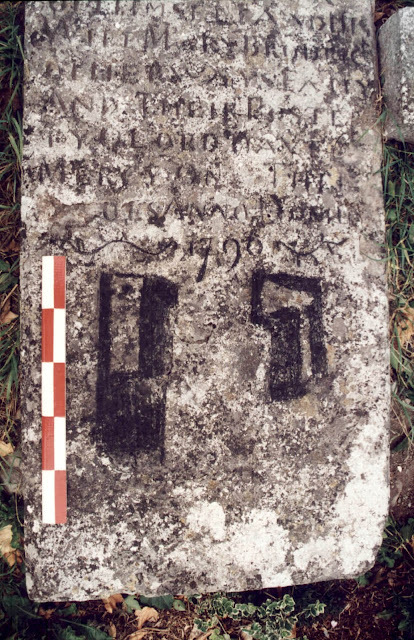 During the period from March 1995 to October 1997, the author was contracted by Craughwell Community Council and FÁS to monitor all archaeologically sensitive work conducted in the graveyards and Medieval churches of Killora and Killogilleen, in the Parish of Craughwell, Co. Galway (Fig. 1). The aims of this project, carried out under licence from the then Office of Public Works, included the cutting of overgrowth within the graveyard, and the trimming back of the burden of overhanging ivy from the standing structures. 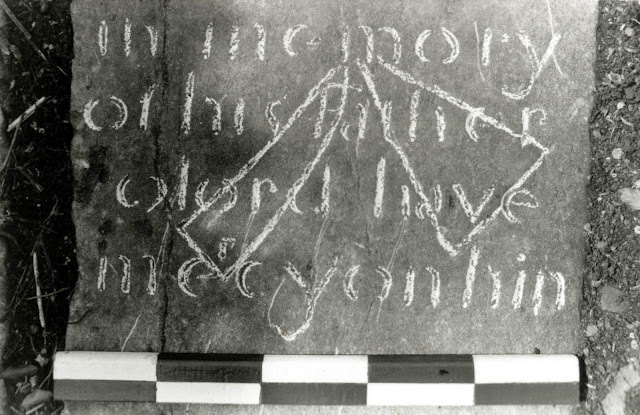 During this time the opportunity was taken to produce a complete record of the gravestone inscriptions from both sites (Chapple 1995a&b; 1997). In the course of this work a number of previously unrecorded gravestones came to light, adding significantly to the known examples from the locality. Other gravestones, while visible before the cleaning took place, received their first detailed recording and archaeological examination. Among the most important of these are a collection of six ‘occupational’ or ‘vocational’ gravestones, bearing depictions of the ‘tools of the trade’ of the deceased. Recent study has concentrated on viewing the corpus of surviving gravestones as a whole, where the contimium of memorial erection is perceived as instrumental to an understanding of the broad tradition of commemorative art (Chapple 2000). Such work has advocated a wholly statistical approach in dealing with a relatively substantial body of remains. This is partly for the perceived objectivity of the methodology where individual monuments are neither favoured nor ignored owing to their possession or lack of eye-catching artistic accomplishments. However, the tone of this paper is decidedly subjective and aims to present and discuss a number of the finest examples of post-Medieval gravestone carving from this area. The stones chosen represent some of the more unusual aspects of the local carving tradition within the corpus of memorials as a whole. Nonetheless, they are still interpretable within the context of the quantifiable trends of symbolic and artistic choice during the 17th to 19th centuries. The sites of Killora and Killogilleen are largely typical of small Medieval churches from all over Ireland. As such they represent the two chief, traditional burial grounds for the ecclesiastical parish of Craughwell and Ballymanagh. The church of Killora is located on a low hill and commands good views over the surrounding landscape, in particular to the south where the land is unwooded. The meaning of the name Killora may be translated as ‘Cill Eóra,’ the church of St. Eora or as ‘Cill Óthra,’ the church of prayers (OSNB, 27; O’Donovan et al. 1839, OSL 183/442; Holt 1909-10, 155.). [i] The earliest recorded reference to the site notes the death of ‘Florent Mac Aonglaigh, Archdeacon of Killoran’ in 1313AD (Connelan & MacDermot 1846, 118.). [ii] The church is also mentioned in a Papal letter of Innocent VIII from 1491, instructing Lawrence Odonchu to transfer control of Killora parish church to Theobald de Burgo of Tuam (Haren 1978, 394-395). Although the standing remains of the church appear to date to the late 15th to early 16th centuries there is evidence for construction and alteration at a number of periods, starting in the late 12th to early 13th centuries. [iii] An area to the north of the site is noted on the 1st edition Ordnance Survey map (1839) as a gleebe containing a souterrain, which raises the possibility of associated settlement from the Early Christian period onwards. It is difficult to accurately assess when the church fell from use, though from the general dates of the oldest gravestones within the church which appear to be in situ indicate abandonment around the middle of the 17th century (but see discussion below). Also similar to Killora, the majority of the upstanding structure of Killogilleen church appears to be of the late 15th to early 16th centuries. 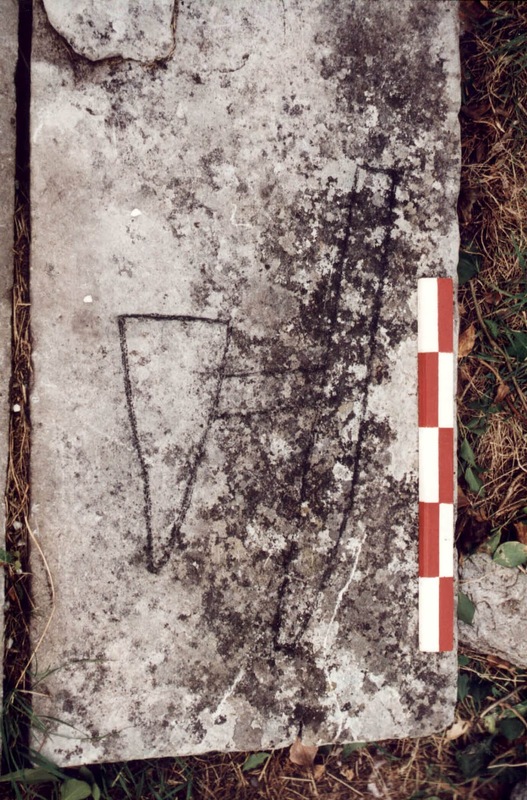 However, the presence of a single block of masonry in the graveyard bearing fine diagonal tooling, typical of the late 12th to early 13th centuries, may indicate an earlier phase of church building. Again, the date of abandonment of this church is problematic. While the modern ‘chapel of ease’ at Ballymanagh was constructed at some time shortly after 1854, it appears likely that Killogilleen had been effectively abandoned considerably before this date (Fahy 1893, 423). Fig. 2. 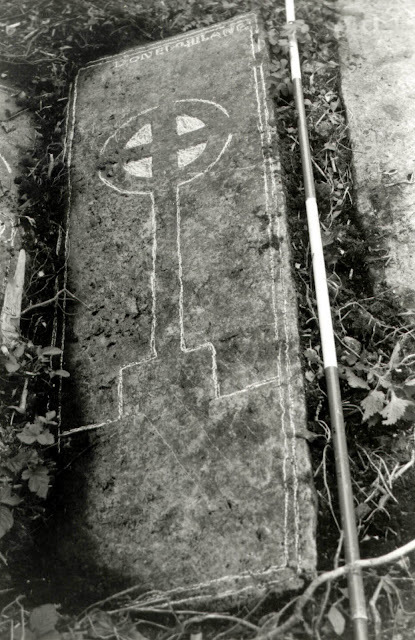 Recumbent ‘Donohoe’ ledger displaying a ringed cross, calvary and the vocational symbols of a blacksmith: tongs, horseshoe, pincers and hammers (Scale 2m ranging rod in 0.5m divisions). The term ‘occupational’ or ‘vocational’ gravestone derives from the fact that these depict the usual implements associated with the profession of the deceased. As such they form a permanent, if selective record of past trade demographics. This selectivity is common to all aspects of gravestone studies of this period in that their survival is somewhat more sporadic at the earlier end of the spectrum. Also, as their use is relatively unusual, their occurrences possess the ability to radically skew perception of temporal shifts within these occupational demographics. [iv] While these caveats may be seen as substantial drawbacks, the fact remains that, especially in the absence of alternate records, these stones allow the ascription of certain trades to defined individuals. The alternative in the rural west of Ireland would be to presume that the vast majority, if not all, of the commemorated dead must have been farmers. While this is largely true, these stones serve to illustrate part of the range of available professions in this area during the 17th to 19th centuries. Fig. 3. 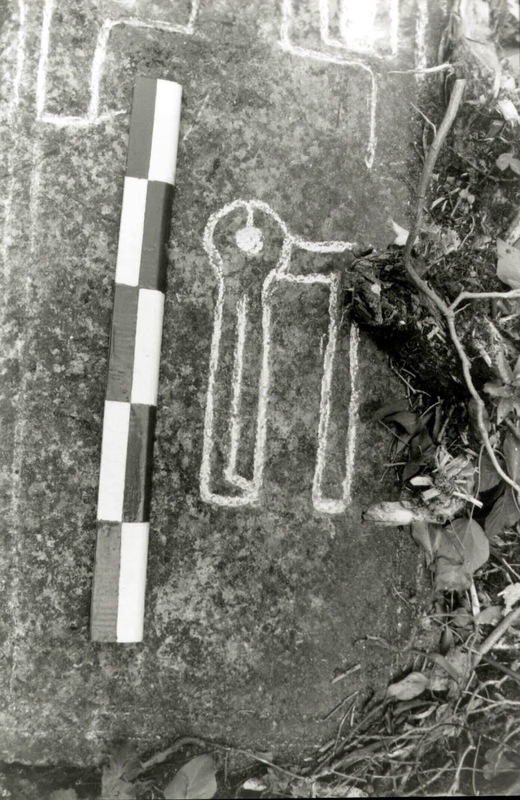 Detail of ‘Donohoe’ ledger displaying hammer, tongs and horseshoe (Scale 0.5m ranging rod in 0.1m divisions). Prior to the commencement of work, only two of these stones had been recorded, both bearing occupational marks of blacksmiths. The first of these is a recumbent limestone ledger which measures 1.78m in length, and tapers from 0.54m at the top, to 0.45m at the base (Fig. 2). 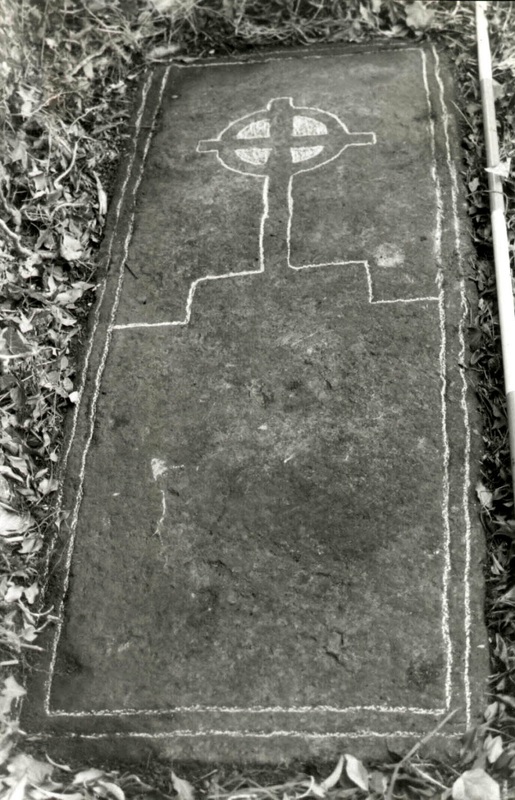 The slab is decorated with an incised, ringed cross calvary (i.e. a stepped base), and bordered by two incised lines. The panels formed by the intersection of the arms and the ring are incised, giving the impression of a false relief decoration. The external edge of the ring breaks at the points where the head and arms should be, but are left uncut. To the left of the shaft is an incised representation of a hammer, while to the right there is a similarly executed depiction of a tongs and horse-shoe (Fig. 3). The areas within the horse-shoe and between the mouth and handles of the tongs are lowered, giving the impression of a false relief decoration, similar to that on the upper portion of the cross. 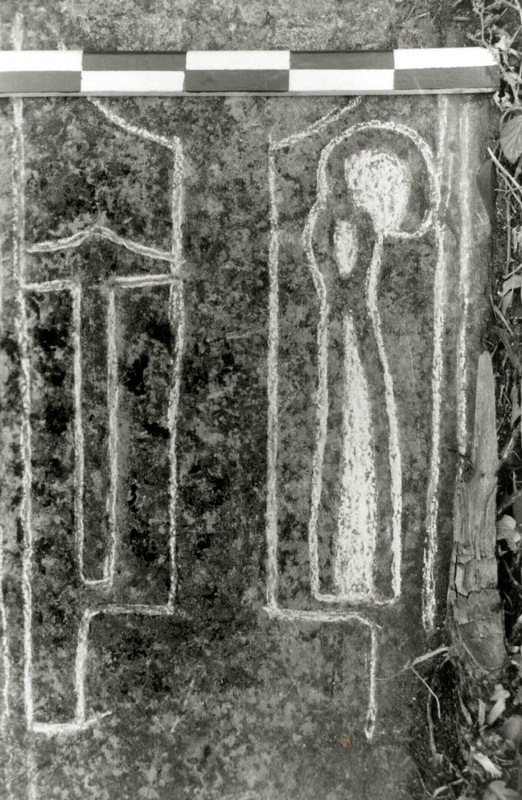 Below the stepped base of the cross is a carving of a pincers and a further hammer (Fig. 4) (Chapple 1995b, 17-18). While the pincers and the hammers are interpretable in a number of vocational frameworks, it is the inclusion of the horse shoe which bears out the ascription of the stone to a blacksmith. Fig. 4. Detail of ‘Donohoe’ ledger displaying pincers and hammer (Scale 0.5m ranging rod in 0.1m divisions). Although this example bears neither a name nor a year of death, it may be dated by parallel to similar examples of this form, which span the period from 1630 to 1680, making it the oldest vocational stone in the local corpus (Pers. Comm. Mr. J. Higgins). With regard to the former, a local oral tradition asserts that this stone is that of a blacksmith who lived in the townland of Carrigeen East, possibly in the area, today known in Irish as ‘Sean Ceárta,’ or the old forge (OS 6” Sheet No. 104;.Pers. comm. Mr. C. Potter, Craughwell). Griffith’s Valuation of 1855 lists only one forge in this townland, leased to a Mr. Lawrence Donohoe. This property is given as compromising a forge and land to an area of three acres, three roods, and eighteen perches (3.77 acres), with a total annual valuation of ten shillings for buildings (Griffith 1855, 111). 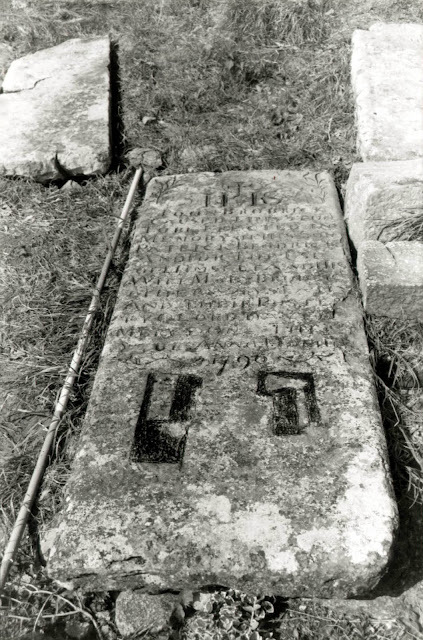 Although there is a hiatus of almost two centuries between this record and the approximate date of the stone, it does not seem improbable that both the valuation and the gravestone relate to the same family. It appears that this stone originally lay in the western portion of the graveyard enclosure and was moved inside the church building, possibly during the 1950s (Chapple 1995b, 78; Pers. Comm. Mr. J. Kennedy, Carrigeen East). While this is the only stone of this particular type within the parish to possess vocational symbols, its basic form should not be thought of as in any way unique. 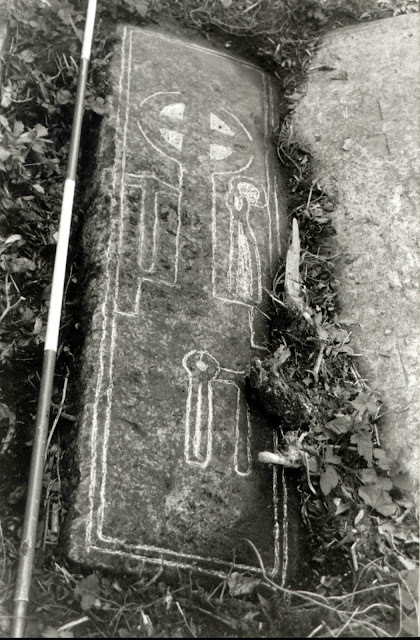 Within the two graveyards there are four ledgers which are similar in almost every respect to the ‘Donohoe’ stone with the exception of the vocational symbols. At Killora one is a plain ledger without inscription (Fig. 5), while the other two commemorate members of the Hilane or O’Hilane family. One of these bears the inscription: “Pray for · the / sovle · of / M · Hilane”[v] (Fig. 6) while the other simply reads: “Donel · O · Hilane” (Fig. 7). A further uninscribed and undated ledger of this type also survives at Killogilleen graveyard. Fig. 5. 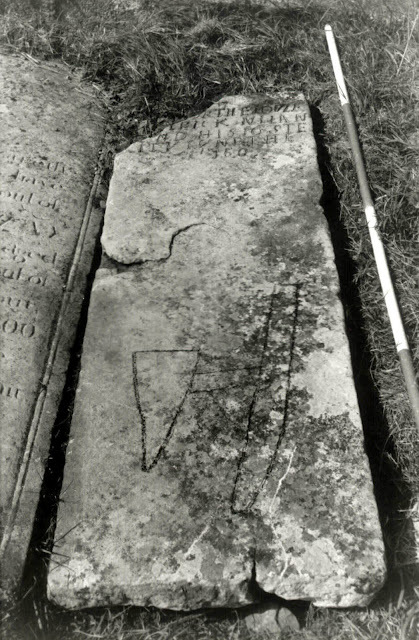 Recumbent unnamed and undated ledger displaying a ringed cross, calvary. Fig. 6. 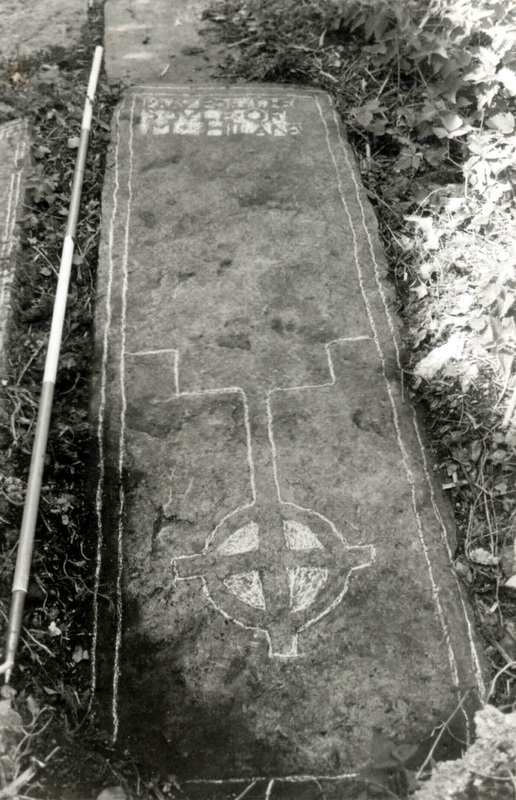 Recumbent ‘M · Hilane’ ledger displaying a ringed cross, calvary. Fig. 7. Recumbent ‘Donel · O · Hilane’ ledger displaying a ringed cross, calvary. The lower portion of the stone bears an incised roundel with a moulded internal border, inside which are the false relief carvings of a crossed hammer and pincers (GAS SMR file: Killora 2; Chapple 1995b, 31). The form of decoration on this stone is similar to a one example at Kilmoylan graveyard, near Tuam, Co. Galway (Pers. Comm. Mr. J. Higgins). Although the symbols depicted do not include the obvious indicator of a horseshoe, the hammer and pincers alone may be taken to imply that the deceased was a blacksmith. This assertion is borne out by Griffith’s Valuation which records this Thomas Kenny as the leasee of a house, forge and garden, in the village of Craughwell, from the Marquis of Clanricarde. The whole had a total area of one rood and fifteen perches (0.34 acres), and a total annual valuation for rateable property of £2 (Griffith 1856, 48). Fig. 8. Recumbent Kenny/Connare ledger (1865) displaying the occupational marks of a blacksmith: crossed pincers and hammer (Scale 2m ranging rod in 0.5m divisions). The upper portion of this ledger, above the text, displays a large, rectangular panel cut in false relief. The panel bears a moulded internal edge, external to which is a broad border in a stylised foliage motif, carved in low false relief. At the centre of the panel a large, false relief roundel displays the ‘IHS’ monogram. [vi] A cross with an expanded terminal at the head, and arms patonce, fitched, springs from the lozenge shaped cross-bar of the ‘H’. A winged cherub head appears on either side of the roundel, in the upper corners of the panel; each above a depiction of a draped ciborium (lidded chalice). These choices from the repertoire of decorational motifs are themselves broad indicators which may be used to place the stone within the context of the temporal stylistic fashions of the area. 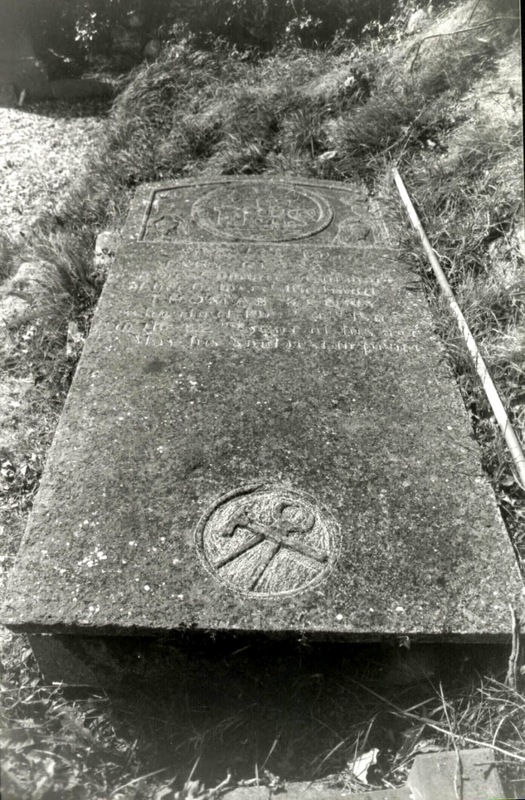 For example, the ‘IHS’ monogram, in various forms, occurs on some 62% of the Craughwell series of gravestones making it the most popular single motif. The ideogram was introduced into the area during the 1760s and remained popular for the next century, before suffering a decline in the 1870s. The symbol shakily regained popularity until finally peaking in the 1930s before falling to the reduced levels seen today. The cherub first entered the Craughwell series as a decorative element during the 1790s, generally increasing in popularity until its apogee in the 1840s. After this time it dwindled in use until finally disappearing after the 1870s. Indeed, during this time its form was by no means static as a number of versions developed and flourished within the broad trend (Fig. 9). The use of the ciborium followed a similar path: introduced in the 1810s, reaching its peak of popularity during the 1850s and ceasing to be utilised after the 1870s. When taken together we see a gravestone with sits at the end of a declining tradition in local monumental practice. The interpretation is confirmed by the statistically generated classification system pioneered by this author where this stone falls in the Class A group (Chapple 2000). Essentially, this category represents gravestones which are characterised by a number of common variables and possess and average construction date of 1814, while their core area of popularity extends from the 1810s to the 1850s. [vii] Considering the stone’s probable construction date as the 1860s at the earliest, it shows a markedly conservative use of symbolic decoration. However, it may be stretching the evidence to attempt to equate this conservatism in the choice of gravestone with either the personal outlook of the stone’s commissioner or the perception of blacksmithing at this time. Fig. 9. Graph of frequency of ‘IHS’ monogram in Killora and Killogilleen graveyards. Fig. 10. Overview of ‘Brodrick’ ledger displaying the vocational symbols of a carpenter or wood worker: tennon saw and axe (Scale 2m ranging rod in 0.5m divisions). Its upper portion bears a deeply incised ‘IHS’ monogram with a cross patée, fitched, springing from the omega shaped cross-bar of the ‘H’ (Fig. 10) (Chapple 1995b, 59). Beneath the cross-bar of the ‘H’ is what appears to be a lightly incised ‘V’, or possibly the much worn remains of an incised heart shape. On either side of both the cross and the monogram are lightly incised foliage motifs with a broad and shallow, incised band arching over them in a semi-circle. 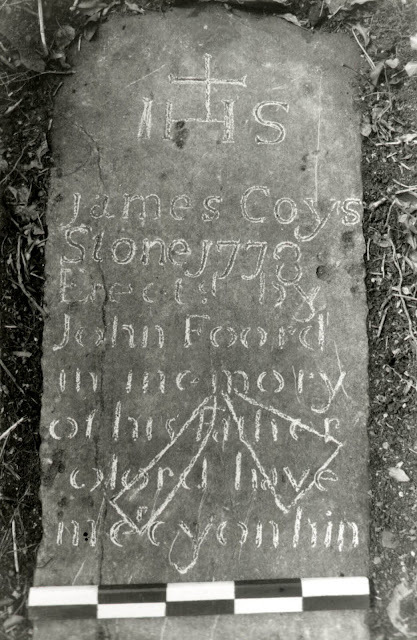 The upper left and right sides of the stone bear an incised foliage motif, while the last line of text is flanked on either side by an incised, meandering foliage motif of a somewhat similar style. The lower portion of the stone bears two incised panels with false relief decoration. The right hand panel is an inverted ‘L’ shaped and bears a representation of a hafted axe (Fig. 11). The left hand panel is larger and bears a false relief carving of a tenon saw in the upper left-hand corner of a rectangular panel. It would appear that this was the gravestone of a carpenter or wood-worker. Fig. 11. Detail of ‘Brodrick’ ledger showing saw and axe (Scale 0.5m ranging rod in 0.1m divisions). Fig. 12. Overview of ‘Nilan’ ledger displaying the vocational symbol of a plough (Scale 2m ranging rod in 0.5m divisions). The portion of the stone above the text bears a somewhat crudely incised cross potent. As with many stones of this type, the occupational marks are confined to the lower portion of the stone, below the text. The decoration gives the overall impression of a stylised plough, presumably the occupational mark of a farmer or ploughman (Fig. 13). It is composed of a large, and crudely incised, representation of a plough-sock, in the form of a rough, inverted triangle to the left. To the right is a further incised element, resembling a stake with a pointed lower end, intended to represent the coulter of the plough. These two elements of decoration are linked by two incised horizontal lines, now very faint. 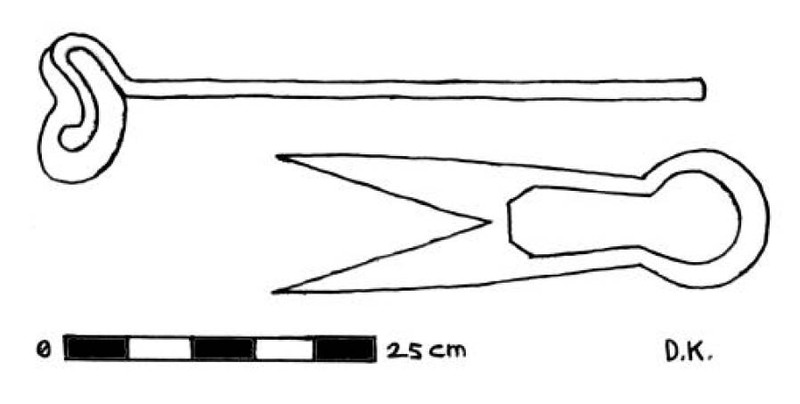 This use of the plough-sock and coulter as occupational symbols is common west of the Shannon, and there are similar examples at Claregalway Abbey, and Loughrea (Pers. Comm. Mr. J. Higgins). Fig. 13. Detail of ‘Nilan’ ledger displaying the vocational symbol of a plough (Scale 0.5m ranging rod in 0.1m divisions). Fig. 14. 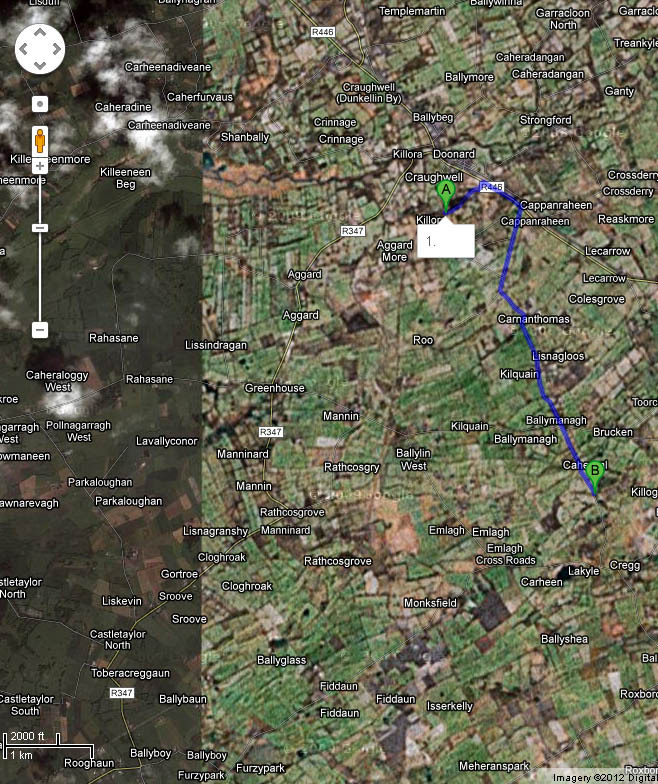 Overview of ‘Nilan’ ledger displaying the vocational symbol of a plough (Scale 2m ranging rod in 0.5m divisions). Fig. 15. Detail of ‘Nilan’ ledger displaying the vocational symbol of a plough (Scale 0.5m ranging rod in 0.1m divisions). On close inspection, the inscription appears to be of two periods; the earlier portion comprising the first two lines, while the remainder is incised in a slightly different style. It appears that the first part of the inscription was associated with the incised occupational marks of the plough-sock and coulter. These symbols obviously predate the cutting of the lower portion of the inscription on the stone as the ‘r’ of the word ‘mercy’ in the eighth line of the text is super-scribed to avoid one of their angles. In the area between the main body of text and the mason’s name are the representations of a shepherd’s crook lying horizontally, above a pair of shears (Fig. 16). The edges of both implements are incised with the areas around the crook head and between the blades and spring of the shears incised to give the impression of false relief. It seems likely that these are the vocational symbols of a shepherd or farmer. Fig. 16. Detail of shears and crook on Crowe table tomb. Illustration by Damien Kavanagh. Although making up only a small portion of the corpus of surviving memorials in the two graveyards, the six vocational stones do add to our knowledge of this place in a meaningful way. 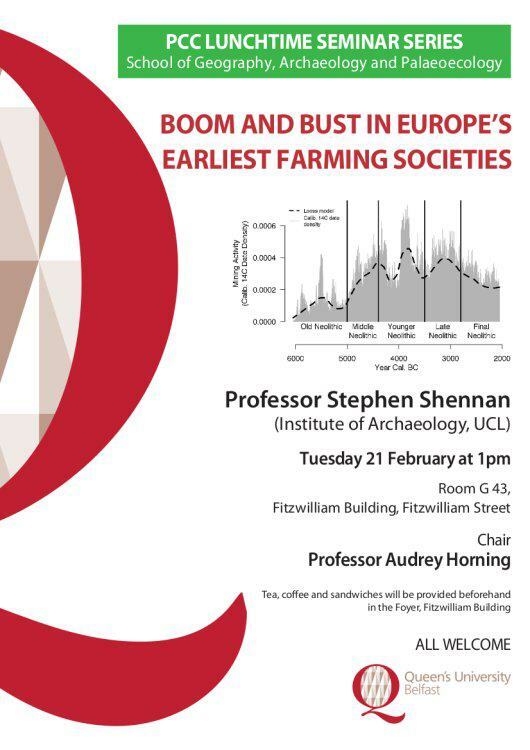 As I said at the beginning, in surveying rural west of Ireland gravestones, the default supposition is usually that those commemorated were of farming stock. With these stones we can begin to change that assumption and recreate a fuller understanding of this early modern society. Yes, there were farmers (or ploughmen), but there were also shepherds, blacksmiths and a carpenter – all occupations that are necessary in such a rural community as this. Chapple, R.M. 1995a Archaeological report on the graveyards of Ardnamoran, Ballynacreeva, Killora, and Killogilleen, Craughwell, County Galway. Unpublished pre-disturbance report. Chapple, R.M. 2000 A statistical analysis and preliminary classification of gravestones from Craughwell, Co. Galway. Journal of the Galway Archaeological & Historical Society 52, 155-71. Connellan, O & MacDermott, P. 1846 The annals of Ireland, translated from the original Irish of the Four Masters. Dublin. Fahy, V. Rev. J. 1893 The history and antiquities of the Diocese of Kilmacduagh. Dublin. 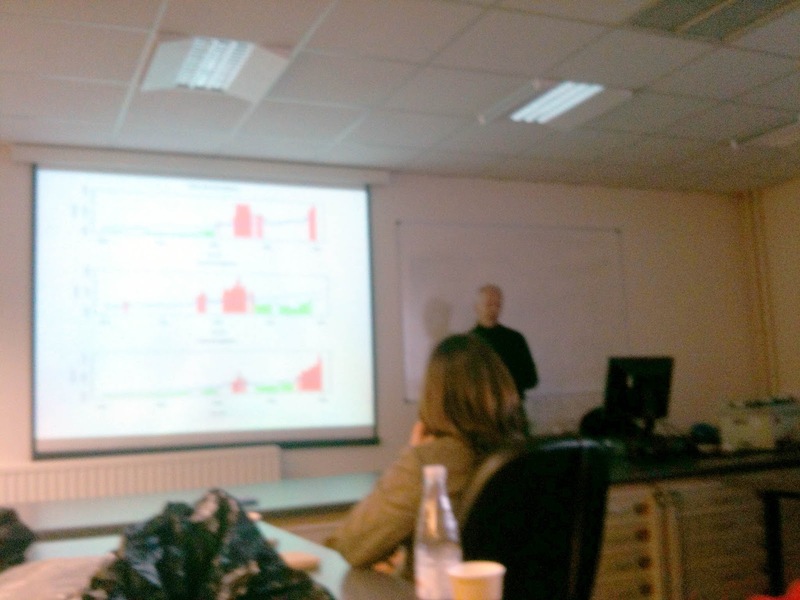 (GAS) Archaeological Survey of Galway, Unpublished Reports. Killora 2. Griffith, R. 1855 General valuation of rateable property in Ireland. Union of Gort. Valuation of the several tenements compromised in the above-named union situate in the Counties of Galway and Clare. Dublin. Griffith, R. 1856 General valuation of rateable property in Ireland, County of Galway. Union of Loughrea. Valuation of the several tenements compromised in the above-named union. Dublin. Haren, M.J. (ed.) 1978 Calendar of enters in the Papal registers relating to Great Britain and Ireland. Lateran Registers 1484-1492. Vol. XV: Papal letters of Innocent VIII. Dublin. Holt, E.W.L. 1909-10 An abridged transcript of the Ordnance Survey Letters relating to parishes in, or partly in, the Barony of Dunkellin, Co. Galway. 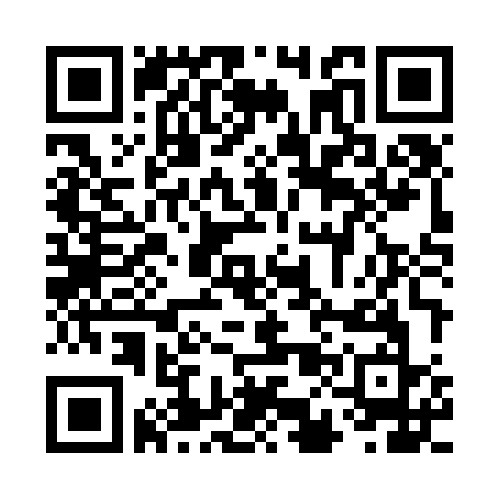 Journal of the Galway Archaeological & Historical Society 6, 123-69. Joyce, P.W. 1912, 1973 The origin and history of Irish names of places. Vol. 2. Wakefield. Kelly, S. 1975 Topography of Craughwell (2) The Blazer 3, 25-6. 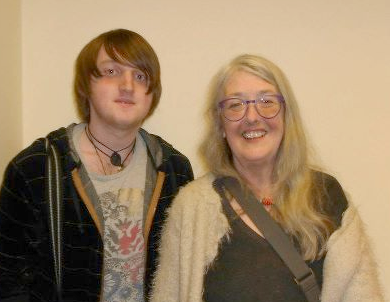 O’Donovan, J. (et al.) 1839, O’Flanagan, M. (ed.) 1928 Ordnance Survey Letters: letters containing information relevant to the antiquities of the county of Galway collected during the progress of the Ordnance Survey in 1839. Vol. 1. Bray. O’Donovan, J. (ed.) 1856, 1900 The annals of the Kingdom of Ireland: from the earliest times to the year 1616 by the four masters. 3rd edn., Vol. 3. Dublin. (OSNB) Ordnance Survey Name Book 1839 Parish of Killora, Co. Galway. Microfilm copy. Walton, J.C. 1980 Pictorial depiction on east Waterford tombstones. Decies 14, 67-83. [i] See also Kelly (1975, 25) for alternative versions of the name. [ii] However, O’Donovan (1856, 1990, 550-551) suggests that the church referred to in this passage is to Killery in the Barony of Tirerril, Co. Sligo. [iii] See Chapple (1995b, 6-10) for a review of the structural evidence. [iv] The occupational stones represent a mere 2% of the surviving corpus. [v] In so far as possible the style of the inscribed text has been accurately reproduced, though to conserve space line-breaks are here indicated by a slash mark, thus: /. [vi] The monogram may be interpreted in a variety of ways, including an orthographical derivation of the first three letters from the Greek Iesous. Among the most popular explanations is that it derives from In Hoc Signo [Vince] (In this sign, conquer). However, Walton (1980, 70) argues that although the monogram may ultimately stem from the Greek, by the beginning of the 17th century it would have been generally understood as standing for Iesus Hominum Salvator (Jesus, saviour of mankind). [vii] Class B stones are characterised by a reduced set of potential rubrics and decorational variables. In general these stones are of a later period, with an average construction date of 1929 (their core period ranges from the 1900s to the 1950s). Class AB is characterised as a semi-distinct, intermediate stylistic grouping, with an average construction date of 1875. Gravestones of this rank possess elements common to both previous groupings and are considered as representing a stylistic nexus between the other Classes (See Chapple Ibid.). [viii] Illegible portions of the text, where possible, have been tentatively reconstructed and are enclosed in square brackets, thus: [ ].